The last time I saw Blue October was at a packed-out London show in support of their 2011 album Any Man In America. To describe their live show as intense would be a serious understatement. Ferocious would be more appropriate. Petrifying would be accurate. The band’s sound was immense and frontman Justin Furstenfeld’s performance dripped with barely contained visceral rage as the album’s songs played out the bitter tales of broken family life and all its attendant carnage. It comes as something of a shock then that ‘Home,’ their new single from the release of the same name, paints a picture of total domestic bliss. Anyone who knows the band already will be aware that Blue October have much more to them than angst-rock. Their previous records (particularly from 2009’s Approaching Normal onwards) are musically ambitious, diverse and beautifully nuanced. Taken as a whole, Home - their eighth album - is no exception, even if the subject matter that makes up the songs is apparently more settled. They’ve always been capable of delivering solid, stadium-ready rock, but they make a point of adding in plenty of leftfield twists, with the heavy use of electronic elements. The use of processed drum sounds in particular dominates Home and this is a continuation of the sound they opted for with 2013’s crowdfunded album Sway. With the seasoned genius that is Tim Palmer back in the production chair alongside Furstenfeld, this record is chock full of audio delights and the manifold talents of multi-instrumentalist Ryan Delahoussaye mean the arrangements are as bold and richly textured as ever. The arena-worthy ‘Coal Makes Diamonds’ kicks the album off, with a thumping distorted bass and piano hook; hotly followed by the synth bass and gated 80s drums of the terrific ‘Driver’. The catchy ‘Heart Go Bang’ that follows is a soaring love song and again, is frontloaded with a piano riff and sprawling arrangement – think Coldplay and Keane at their anthemic best. The singalong ‘I Want It’ has perpetually building energetic drums, yet more piano and some very tastefully placed vocal effects. As each song unfurls you can’t help but wonder just how they got the sound so enormous and wide. This vast sonic expanse is necessary to accommodate the full breadth of Furstenfeld’s perfectly crumbly vocal delivery as he moves effortlessly from a Dave Matthewsesque warble to soaring passionate heights, reminiscent of the superb Angie Aparo (do look him up if you’ve not heard the name). Acoustic guitars are at last allowed to lead with the debut single and title track ‘Home’. 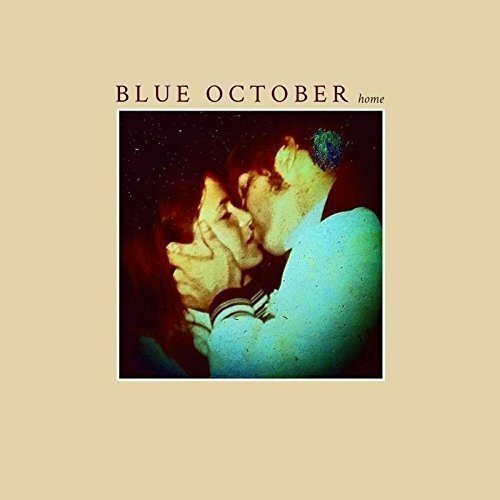 ‘Home’ is such saccharin pop that I have no clue what it’s doing on a Blue October album at all. Either I’m missing some major irony or it is nothing more than an over-peppy ain’t-life-great ditty that the album could really do without - “Daddy loves Mama and Mama loves him / Tomorrow we get to do it over again” - it wouldn’t even need a lyric change to transfer to an episode of Sesame Street. Perhaps the brief was for an upbeat pop hit to help spread the band’s appeal but for an act that have always shown such lyrical and musical depth it feels superficial and throwaway at best. It’s a good thing that normal service is quickly resumed with the more haunted ‘We Know Where You Go’ (again very Keane) and the frenetic ‘The Lucky One’, both of which have piano-led modern pop dressings but boast darker edges and the production twists to keep your attention. The plaintive ‘Break Ground’ is the most heavily electronic thing on offer: made up largely of beats and atmospherics against Furstenfeld’s harmonised vocal. As if to atone, angry electric guitars and live drums are then allowed to take centre stage and a more familiar sound is ushered in with the menacing ‘Leave it in the Dressing Room’. The intimidating rap swagger of ‘Houston Heights’ is also refreshingly in-your-face and just a little bit sweary. The eight-minute epic ‘Time Changes Everything’ - the record’s showpiece - successfully melds all the Blue October guises: a trip-hop opening with reverse-reverbed vocals; raging rock episodes; pared down intimate passages and a stadium climax that U2 would be proud of, to top it all off. Blue October come down from what has been a rollercoaster of a record with ‘The Still’ an expansive, atmospheric instrumental to close proceedings and I’m particularly pleased that I stayed the course. Initially I wasn’t sure I could properly cope with a Blue October that wasn’t always on an emotional knife-edge but this record is all the richer for its moments of musical and lyrical stability in between. Sonically it is a masterwork and there’s a real cohesion to the array of disparate styles on offer when it could so easily have sounded confused. Like all great records, Home requires some listener commitment but it pays serious dividends and this is a set of songs that will stay with me, with the added bonus that not quite so many of them are likely to give me nightmares.